Josefino Alvarado, a California farm worker, describes his typical morning picking blueberries at a Ventura County farm. As the sun beats down on him and his fellow workers, a crackle of static hums at their feet. “Hola mi gente,” (Hello, my people) a voice calls out from the radio’s speakers in Spanish. Then, “tanìndíí,” which means ‘good morning’ in Mixteco. On this farm and most of the farms nearby, workers have their radios tuned into the same station: 94.1, Radio Indígena. Radio Indígena (indígena means indigenous in Spanish) is one of the first indigenous Mexican radio stations in the United States. The community-run station boasts 40 hours of original programming every week, broadcasting music and talk shows in a handful of indigenous languages, as well as Spanish programming too. The station is a welcome cultural lifeline for thousands of farm workers who speak Mixteco or other indigenous Central American languages. “Listening to it is a point of pride,” Alvarado, who is a frequent listener, said. While he only understands Spanish and Mixteco, he often will listen to some of Radio Indígena’s shows in Zapoteco, Triqui, and Nahuatl. Even if he doesn’t understand them, he said he’s proud to hear the languages being kept alive on the airwaves. Alvarado, who moved to the U.S. in 1997, was born and raised in the city of Oaxaca in central Mexico, where he and his family learned Mixteco as their first language. Although Mixteco has come into the national spotlight thanks to the Academy Award-winning film, Roma, the language is still virtually unknown to the general population. Mixteco or Mixtec is spoken in the central region of Mexico often referred to as “La Mixteca” — which includes parts of Oaxaca, Puebla and Guerrero. Mixteco is part of a group of Mesoamerican languages whose origins go back 10,000 years. There are many variations of Mixteco, and the dialects have also absorbed some Spanish and English words. Experts say that migration and economic pressure have led these languages to extinction both in their home countries and the U.S. Due to economic and cultural pressure in Mexico, many Mixtec communities are shifting to Spanish. UNESCO considers almost half of Mixteco’s 50 dialects to be either severely endangered or at risk of endangerment. According to the 2010 census, over 685,000 Latinos in the U.S. identified themselves as American Indian, up from around 400,000 in 2000. But experts agree that the actual number of indigenous Latinos in the U.S. is much higher than estimated because many don’t report to the census due to stigma and immigration status. Alvarado is not alone. Ventura County is home to an estimated 20,000 indigenous people from southern Mexico. Due to soil erosion in the ancestral farmlands of the Mixteca region, many Mixtecs have been drawn to California in search of agricultural work. About one-third of farm workers in California speak indigenous languages from southern Mexico, including Triqui and Mixteco. Many of them don't speak Spanish or English. “There’s a lot of radio stations in Oxnard, but they just play music,” said Roberto Jesús, who listens to the show every morning as he drives to work, getting informed about the news and about his legal rights as an immigrant. Jesús, who is from the Mexican state of Guerrero, works in the strawberry fields of Ventura County. Like most from his community of San Rafael, Jesús spoke Mixteco and it was a struggle just to learn Spanish as a second language. The prospects of learning English, he said, were virtually impossible. In the U.S., Mixtecs face barriers because of their limited English and sometimes limited Spanish. This leaves many of them vulnerable to exploitation and discrimination. That’s why Radio Indígena came about. Radio Indígena is hosted and run by the Mixteco Indígena Community Organizing Project (MICOP), a nonprofit organization formed to provide health outreach, humanitarian support and language interpretation to this underserved and often unnoticed community. “There are very few ways for us to receive information in our own language,” Arcenio Lopez, executive director of MICOP and Radio Indígena, said. The project began in 2014 as a community radio station that only lived online, but after years of fundraising, the station finally reached FM airwaves in 2017. 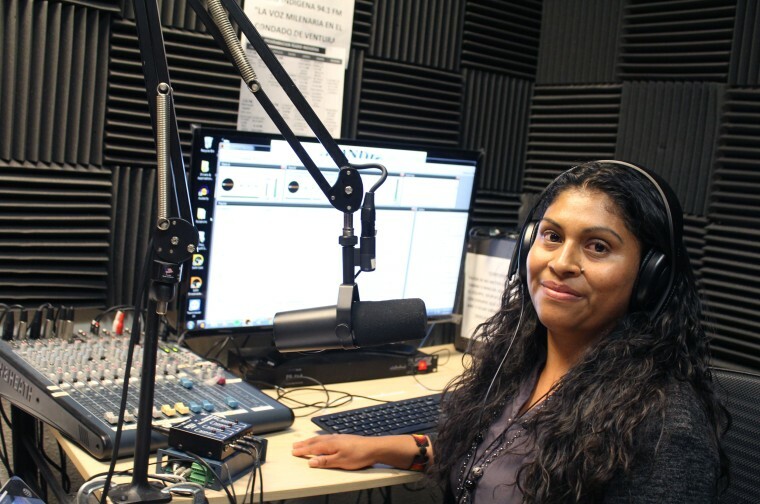 Radio Indígena started when organizers saw a void in the city of Oxnard but López said that the station has listeners from all over the country and world, since the episodes are available to stream online. People can also listen to similar efforts around the state, such as Radio Bilingue in Bakersfield and La Voz del Valle in Baja California. Prior to Radio Indígena, Alvarado said that many Mixtecs in California were left in the dark about what was happening in their communities because there was no news source accessible to them. Throughout the day, listeners hear a variety of public service announcements, from what to do during an ICE raid to what the agricultural labor laws are. Delfina Santiago and Carmen Vasquez co-host a show on Radio Indígena every Sunday from 10 a.m. to 1 p.m. Even though they don’t get paid for their work, the two spend lots of time during the week preparing for their program, “Al Ritmo De Chilena,” which is an educational program that delves into the history of different indigenous cultures for each episode. Santiago and Vazquez say that the digital age has played a role in keeping their language alive and keeping folks connected to one another, in a world where they might otherwise feel alone. Indigenous Mexican music can be found on YouTube and SoundCloud. During the week, Santiago works in the Ventura County flower farms, and Vasquez as a teacher’s assistant. The co-hosts choose a dance or musical tradition from different indigenous Mexican cultures and research its origins as a way to educate listeners about their history, as well as their neighbors’ histories. They hope that their work will not only connect listeners with their roots but also protect Mixtec languages from going into extinction altogether. Vasquez said that growing up, her parents spoke Mixteco but wanted her to only speak Spanish. They didn't want her to suffer because of her lack of Spanish the way other indigenous people in Mexico have, she said. But Vasquez thinks differently. She enjoys volunteering at Radio Indígena because it empowers her and her listeners to be proud, not ashamed, of their language.